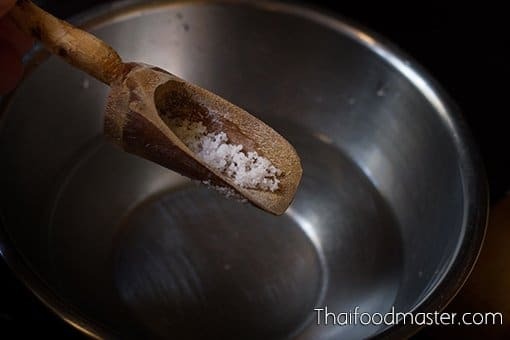 Salting and sun-drying are common preservation methods applied to perishable ingredients like meat and fish: The end product can be stored for a long period and, meanwhile, the savory umami flavors intensify and become more concentrated. 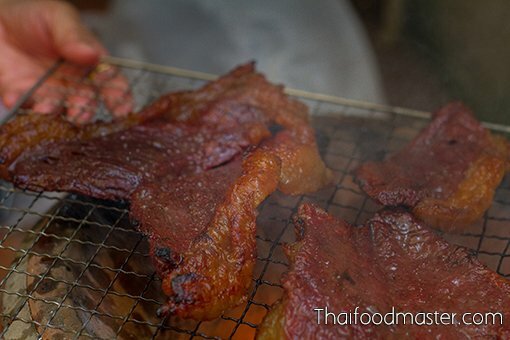 In this dish, umami-charged, salted sun-dried beef is gently grilled over charcoal, adding smoke and caramelized elements that emerge in the core of the flavor profile, alongside the umami and the savor of fat. 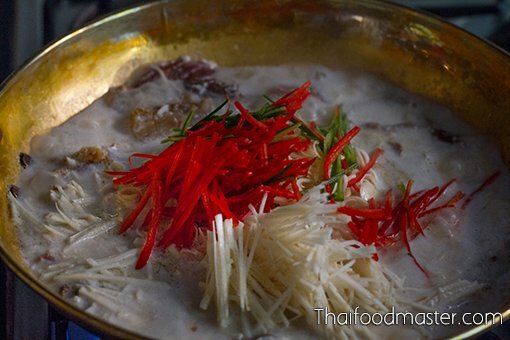 The meat is then cut into bite-size pieces, and slowly braised in thick coconut milk. The coconut fits perfectly onto the triangle of umami, fat and smoke. It brings its own umami and fatty shades, and introduces a rich sweetness that pairs seamlessly with the caramelized character of the grilled beef. The braising also rehydrates the beef and softens it. 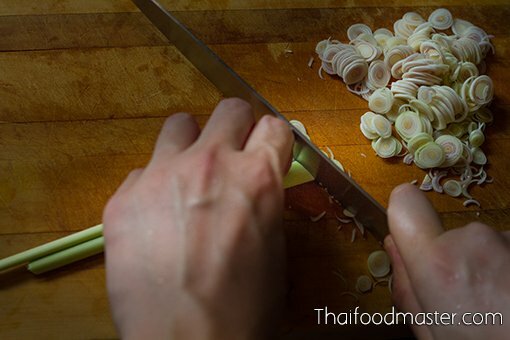 Bamboo shoots, shallots, galangal, lemongrass and kaffir lime leaves are added, perfecting the dish with a complementary sweetness, echoing the umami hues, and cutting citrusy notes while creating hidden astringent layers. The dish is finished with fresh chili peppers and hair-thin julienned kaffir lime for a fresh aroma and piquant bite. 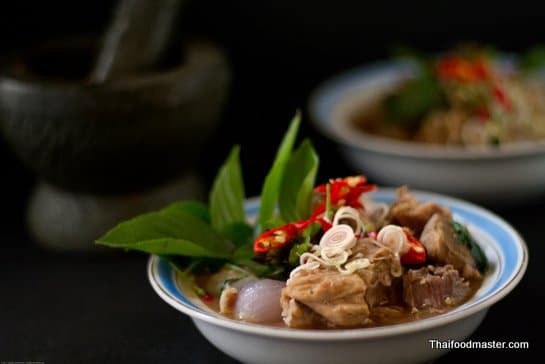 This dish is yet another demonstration of how Siamese culinary wisdom employs just a few common household ingredients and basic cooking techniques to create a dish bearing a sophisticated flavor profile and pleasing textures. 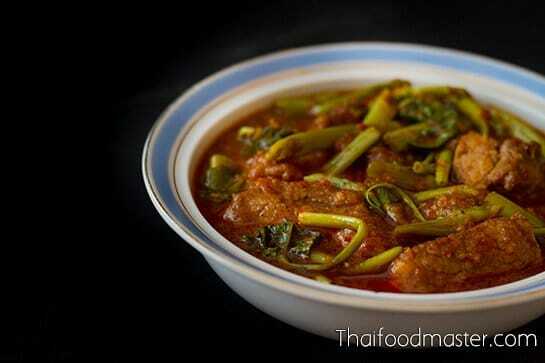 The name of this dish suggests that, in the old days, watery dishes were generally referred to as “curry” (gaaeng, แกง,) with or without the presence of a curry paste. This dish most likely evolved from tom yam soup; the shallots, galangal, lemongrass and kaffir lime leaves – besides improving the dish’s taste and aroma – also naturally facilitate the digestion of the meat. 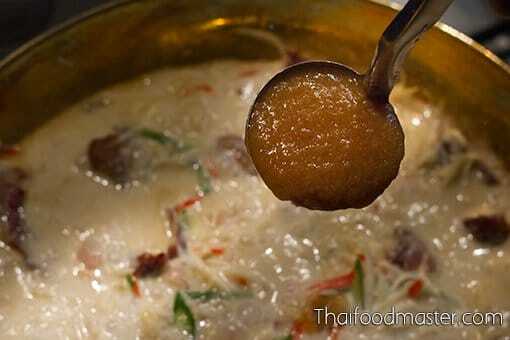 The dish should have clear notes of sourness, to counterbalance the almost cloying richness of the coconut and beef. Pickled bamboo shoots are used, but if fresh, crunchy bamboo shoots are used, more tamarind paste should be added to compensate. 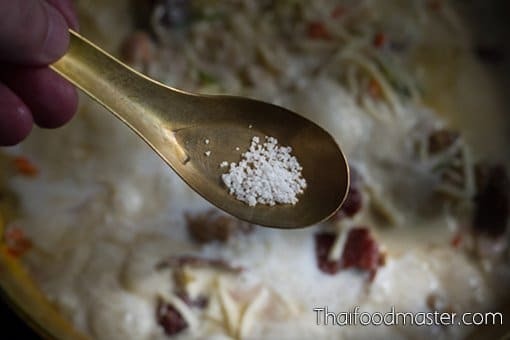 The recipe we present today is from Mrs. Samaknantapol (Jeep Bunnag) (นางสมรรคนันทพล, จีบ บุนนาค) (1889-1964), from her 1941 book “Sam Rap Raawp Bpee, Volume II” (“สำรับรอบปี”). 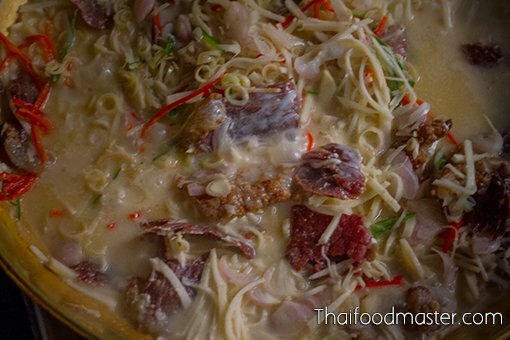 Jeep Bunnag was the granddaughter of culinary legend Lady Plean Passakornrawong, the author of the 1908 cookbook “Maae Khruaa Huaa Bpaa” (แม่ครัวหัวป่าก์). 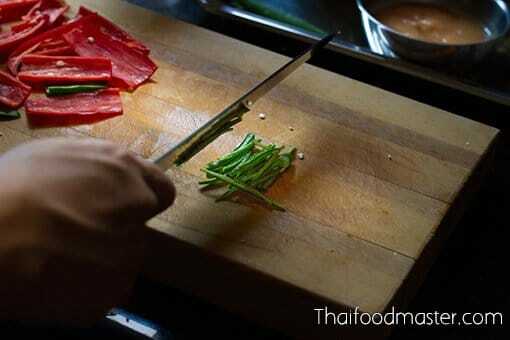 Wash the sun-dried beef thoroughly before grilling. This rinsing removes excess saltiness as well. 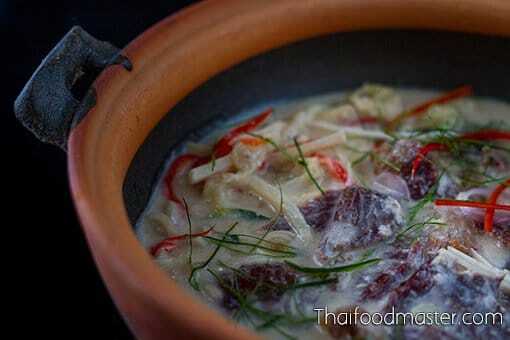 Sun-dried beef can be replaced with a firm meat or a salted fish such as salted snakeskin gourami (ปลาสลิดเค็ม). 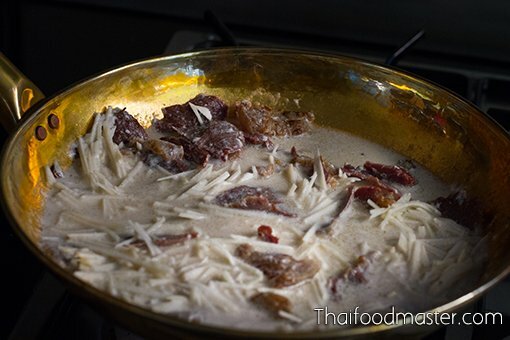 If salted fish is used, it would make sense to use young tamarind leaves rather than the tamarind paste. 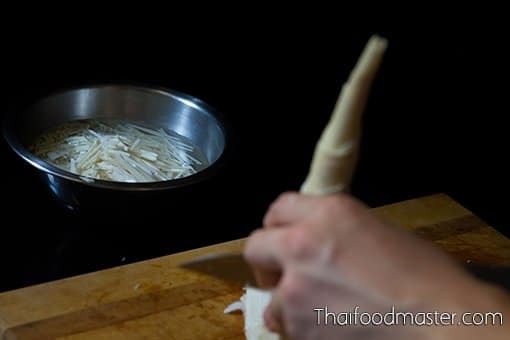 Bamboo shoots – use fresh, pickled, or a combination of both. Use half-thick coconut cream, or coconut cream diluted with water in equal quantities. 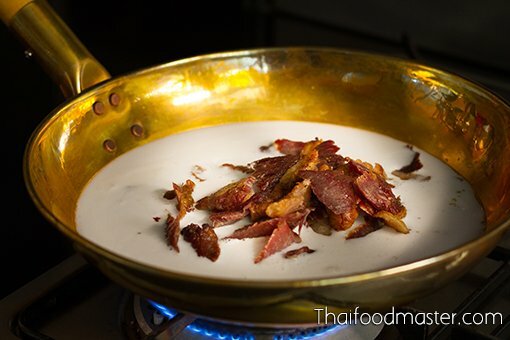 To prepare the sun-dried salted beef: Use one kg of thinly sliced beef – any cut will do. Mix with 1 1/2 tablespoons of salt, and the same amount of granulated sugar. Knead the beef with the sugar and salt for couple of minutes until all is incorporated. Let it rest for about 30 minutes before laying the beef slices on a mesh screen or dehydrator mesh, and place in direct sunlight for total of four hours (two hours on each side). 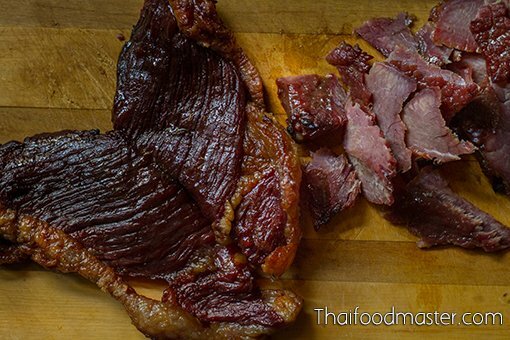 This will result in a semi-dried beef that is suitable for immediate use – and perfect for this recipe. Of course, a longer drying period is required for longer storage periods. Wash the sun-dried beef and pat it dry with paper towels. Charcoal-grill the beef over low heat until it is nicely caramelized. Slice the beef into bite-size pieces. Prepare three bowls with salt water. Julienne the fresh bamboo shoots; set aside, covered in salt water. Thinly slice the lemongrass; set aside, covered in salt water. Julienne the galangal; set aside, covered in salt water. Julienne the fresh green and red long chilies; set aside. 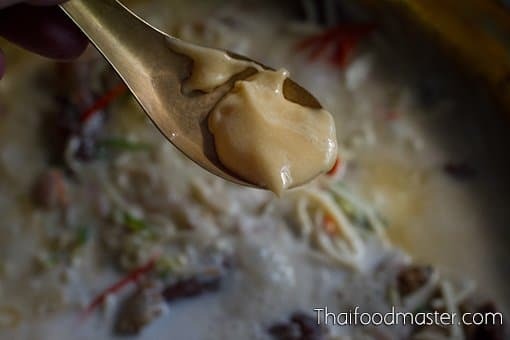 Place a pot with half-thick coconut cream over medium-low heat, and add the beef. Bring to a boil, and simmer over low heat until the meat starts to soften. Add liquids if necessary. 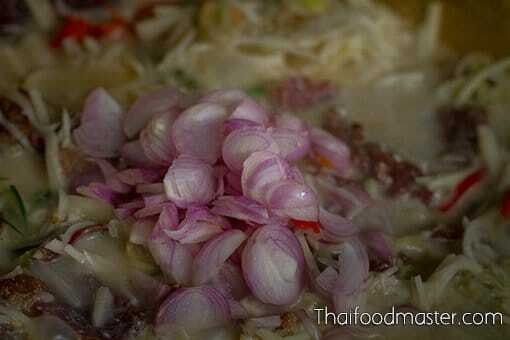 Cook until the bamboo shoots are cooked, but still hold their crunchiness. 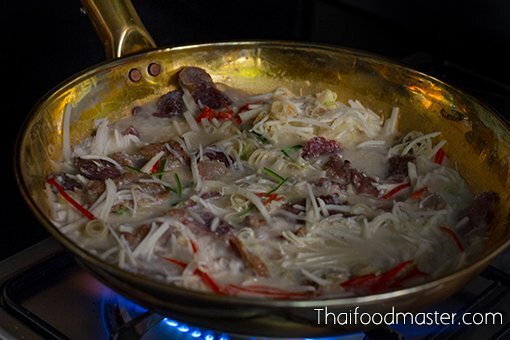 Add the galangal and lemongrass. Keep simmering until the shallots soften; at this stage the meat should be soft enough, but still somewhat chewy. 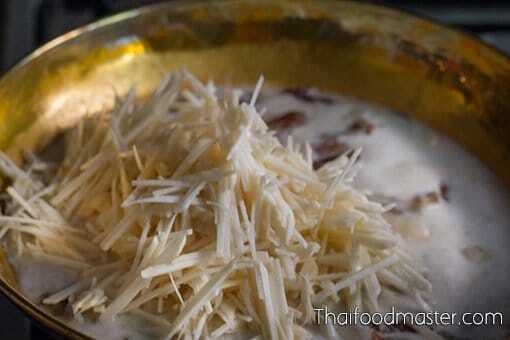 Add coconut cream to improve the texture of the broth. 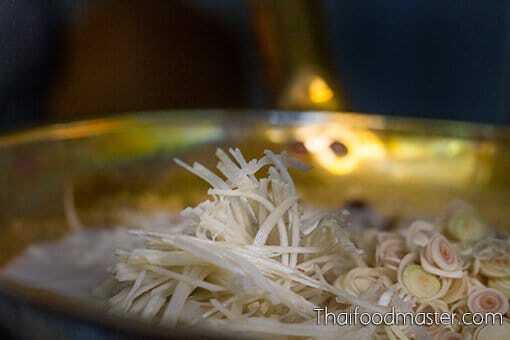 Garnish with hair-thin julienned kaffir lime and serve. 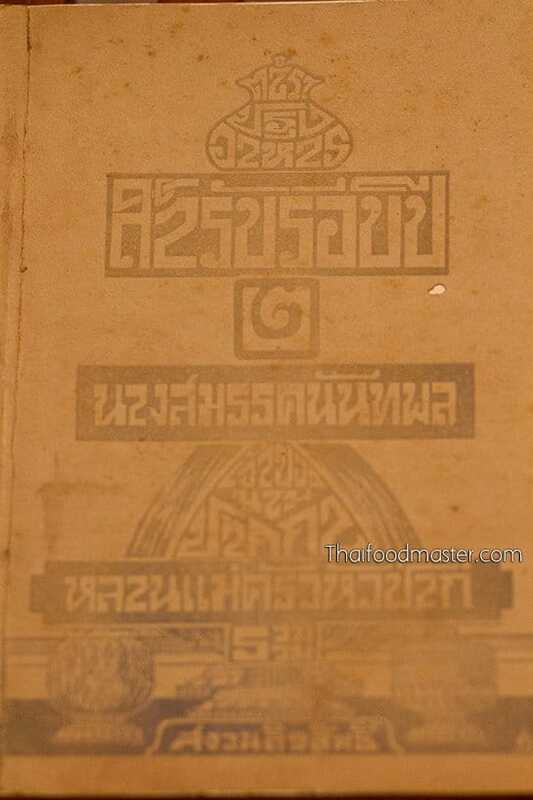 Breaking news: The oldest Thai cookbook, as well as history’s first-ever recorded recipe for Phanaeng curry, are revealed for the first time on Thaifoodmaster.com – A 126-year-old cookbook written by one of Siam’s most revered singers, Maawm Sohm Jeen (Raa Chaa Noopraphan) (หม่อมซ่มจีน, ราชานุประพันธุ์), has been rediscovered, offering a unique glimpse into the culinary repertoire of 19th-century Siam. 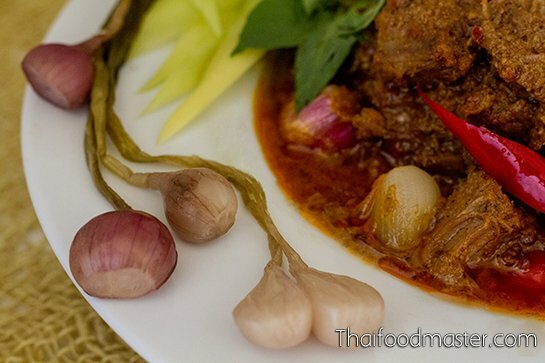 In this chapter we examine the different forms of phanaeng curry from the 1800s to the present day, as we reconstruct the 19th-century version and craft step-by-step a traditional beef phanaeng curry. 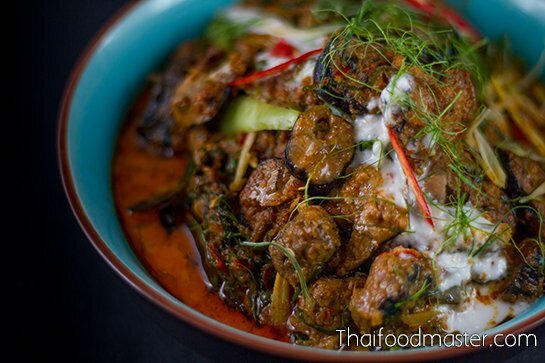 This eel curry includes a greater-than-usual quantity of aromatics used over three stages. First, the eel is cleaned and sliced into segments; then it is fried with a generous amount of lemongrass, galangal, kaffir lime leaves and shallots. These help to counter its muddy and somewhat iron-like odor, which disappears along with the liquids and the aromatics. 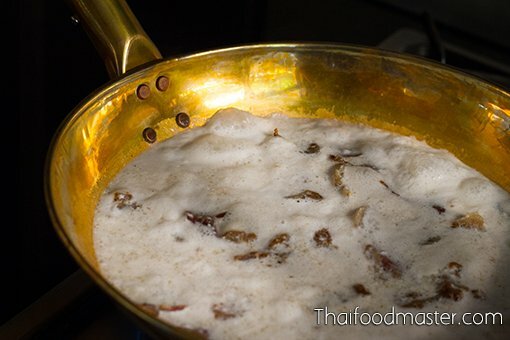 This eel curry recipe is adapted from the vintage book: “Gap Khaao O:H Chaa Roht” by Ging Ga Nohk) (กับข้าวโอชารส โดย กิ่งกนก – กาญจนาภา พ.ศ. 2485). This rare book was written in 1942 during WWII, a period of global turmoil in which Thailand was invaded by the Japanese. 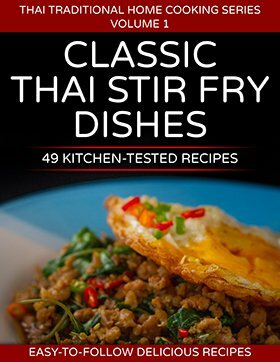 That same year marked a decade from the ending of absolute monarchy rule in 1932, and one generation away from the peak of the Siamese culinary renaissance that flourished in the court of King Rama V (1868-1910): a nostalgic era for its children who are still with us to remember and reflect on those times.